Shipping nationwide direct to your doorstep. This pallet truck is our top selling truck, built for a lifetime of hardwork. We have sold thousands of these over the years, the solid construction, maintenance free rollers, ergonmic handle design and the robust pump make this pallet truck a best buy. Choice of steer wheels and load wheels. - Progressive - Pallet Truck brakes operates like a bicycle brake i.e. the more you pull the brake lever, the harder the brake is applied. This type of system is also fitted with a parking brake. Available on standard, quicklift, reel handling and low profile trucks. 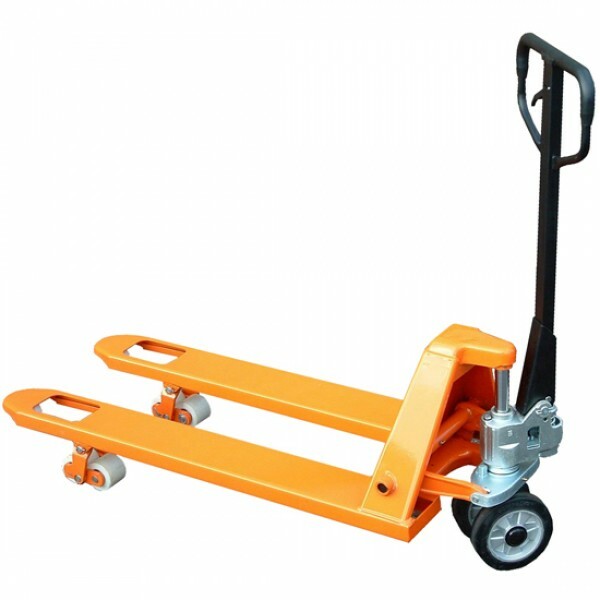 - Foot-brake - Pallet Truck brake is operated using the foot to apply and release brake. - Quick-Lift - lifts up to 200mm with only 6 strokes (normally 13 to 14). All BF pallet trucks up to 3000kg in capacity can be fitted with a 'Quicklift' pump. - If you order a brake type and/or Quick Lift when you order your pallet truck then it will be supplied to you ready with the options fitted! @ Handling Equipment Sales Ltd - All Rights Reserved 2017.